Complete dentures are for patients who have lost most or all of their teeth. A partial denture is appropriate for those who have some natural teeth remaining. A denture slightly improves chewing ability and provides support for facial muscles. It can enhance the facial appearance and smile. An advantage of immediate dentures is that the wearer does not have to be without teeth during the healing period. However, bones and gums can shrink over time, especially during the period of healing in the first six months after the removal of teeth. When gums shrink, immediate dentures may require rebasing or relining to fit properly. Immediate dentures usually have horrible fit and retention because the denture was made before the extractions. The lab technician has to guess where the tissue will be after extraction. A conventional denture can then be made once the tissues have healed. Healing may take at least 6-8 weeks. Full dentures are not a replacement for teeth. They are a replacement for no teeth. The dentures will not function like natural teeth. Patients must be prepared for the huge physiological and emotional effects of wearing dentures. There are many problems associated with conventional (old fashioned) dentures. The dentures merely rest on the jaw bone. The dentures are free to move around and do not generate the same chewing forces as natural teeth. Removable partial dentures usually consist of replacement teeth attached to pink plastic bases, which are connected by metal framework. Removable partial dentures attach to your natural teeth with metal clasps or devices called precision attachments. Precision attachments are generally more cosmetic than metal clasps and are nearly invisible. Crowns on your natural teeth may improve the fit of a removable partial denture and they are usually required with these custom attachments. Dentures with precision attachments generally cost more than those with metal clasps. Furthermore, Dr. Nugent can make dentures that contain no metal. The denture process takes about one month and multiple appointments: the initial diagnosis is made; an impression and a wax bite are made to determine vertical dimensions and proper jaw position; a “try-in” is placed to assure proper color, shape and fit; and the patient`s final denture is placed, following any minor adjustments. First, an impression of your jaw is made. In addition, measurements are made to show how your jaws relate to one another and how much space is between them (bite relationship). The color or shade of your natural teeth will also be selected. The impression, bite and shade are sent to the dental laboratory so a denture can be custom-made for your mouth. For the first few weeks, a new denture may feel awkward or bulky. However, your mouth will eventually become comfortable to wearing it. Inserting and removing the denture will require some practice. Your denture should easily fit into place. Never force a partial denture into position by biting down. This could bend or break the clasps. It’s best to stand over a folded towel or a sink of water when handling your denture, just in case you accidentally drop it. Brush the denture (preferably with a denture brush) daily to remove food deposits and plaque, and keep it from becoming permanently stained. Avoid using a brush with hard bristles, which can damage the denture. Look for denture cleansers with the American Dental Association (ADA) Seal of Acceptance. Pay special attention to cleaning natural teeth that fit under the denture`s metal clasps. Plaque that becomes trapped under the clasps will increase the risk of tooth decay. Hand soap or mild dish washing liquid to clean dentures is also acceptable. Other types of household cleaners and many toothpastes are too abrasive and should not be used for cleaning dentures. A denture could lose its proper shape if it is not kept moist. At night, the denture should be placed in soaking solution or water. Over time, adjusting the denture may be necessary. 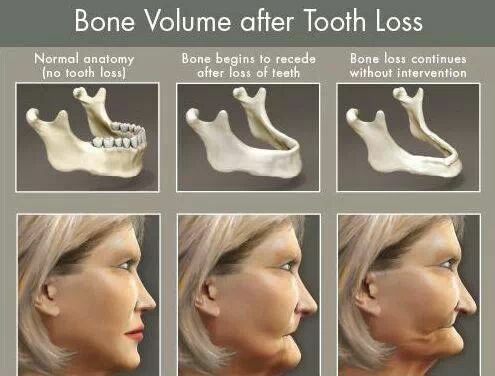 The first year after teeth extractions results in the most bone loss. This bone loss continues forever. Your bone and gum ridges will recede or shrink, resulting in a loose-fitting denture. Loose dentures can cause various problems, including sores or infections. Dentures that do not fit properly can be adjusted by Dr. Nugent. If your denture no longer fits properly, if it breaks, cracks or chips, or if one of the teeth becomes loose, call our Pasadena dental office immediately. In many cases, Dr. Nugent can make necessary adjustments or repairs, often on the same day. Complicated repairs may require that the denture be sent to the dental laboratory. Over time, dentures will need to be relined or re-made due to normal wear. Eating will take a lot of practice. Start with soft foods cut into small pieces. Chew slowly using both sides of your mouth at the same time to prevent the dentures from tipping. As you become familiar with chewing, add other foods until you return to your normal diet. Some people worry about how dentures will affect their speech. Consider how your speech is affected when you have a number of your natural teeth missing. Pronouncing certain words may require practice. Reading out loud and repeating troublesome words will help. If your dentures “click” while you`re talking, speak more slowly. You may find that your dentures occasionally slip when you laugh, cough or smile. Reposition the dentures by gently biting down and swallowing. Denture adhesives can provide additional retention for well-fitting dentures. Denture adhesives are not the solution for old, ill-fitting dentures. A poorly fitting denture, which causes constant irritation over a long period, may contribute to the development of sores. These dentures may need a reline or need to be replaced. If your dentures begin to feel loose, or cause pronounced discomfort, call Dr. Nugent immediately. The better solution to dentures is implant dentures. These dentures are stabilized by dental implants in the jaw bone. 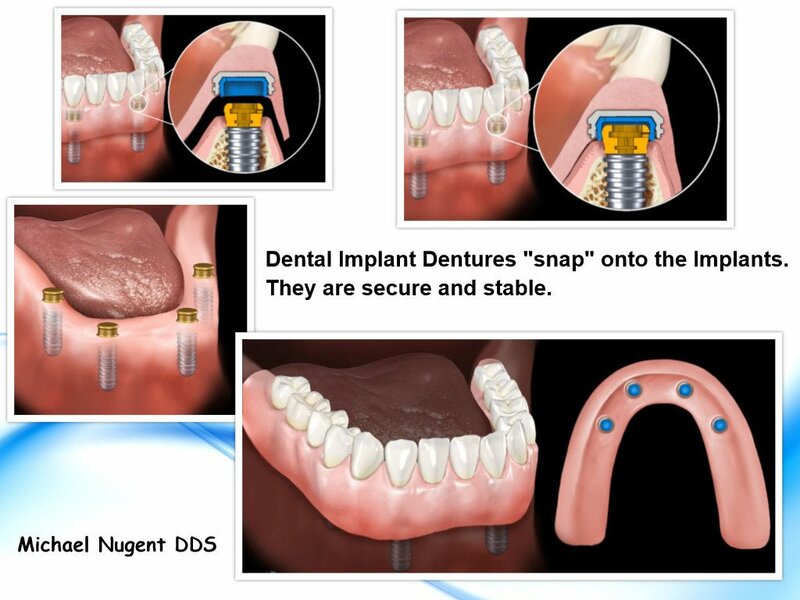 The dentures literally “snap” onto the implants. No more loose dentures. The implant dentures are anchored to the jaw bone so chewing forces are greatly increased. No denture adhesives are needed. Plus, the dental implants will prevent the jaw bone from melting away. Dentures and Partial dentures can help patients avoid the embarrassment of missing teeth. 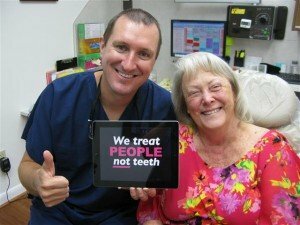 Dr. Nugent is an award-winning dentist that can help you achieve your dental goals. Visit us at 3421 Burke Rd Ste A, Pasadena, Texas 77504.